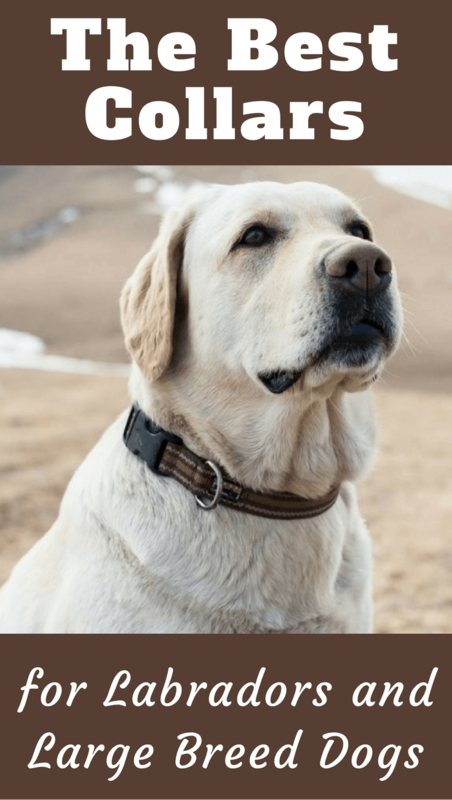 With so many types and styles available, choosing a leash and collar for your Labrador isn’t the easiest decision in the world! There's leather, nylon, cotton and more to choose from. 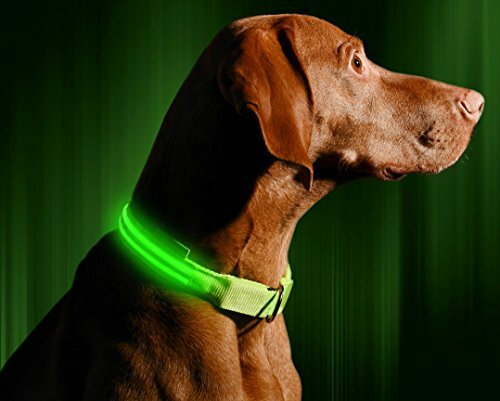 'Breakaway' safety collars and those that flash to keep your dog safe at night. There's even GPS tracking and locating collars to find lost dogs and keep tabs on their activity and exercise. There's also 'no-pull' solutions that are very effective at stopping a tough dog from pulling, managing the problem while training them to walk nicely. 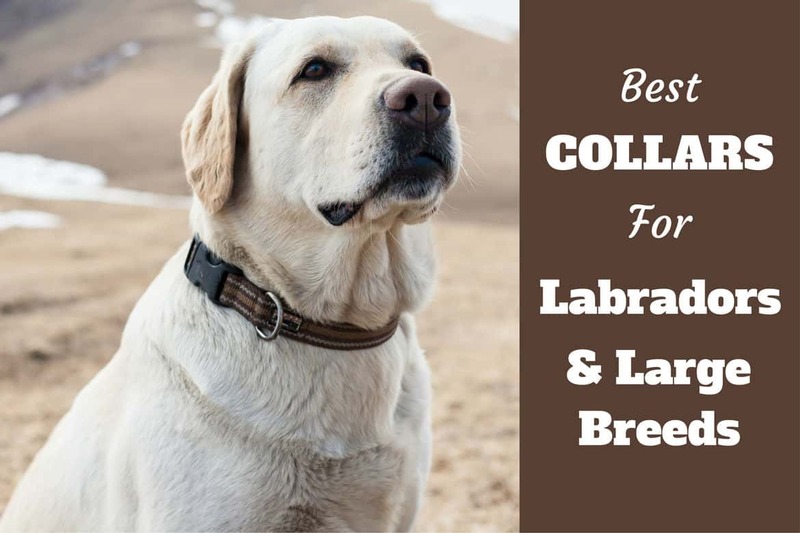 To help you cut through the noise and get directly to a selection of well made, durable, highly rated collars, we've put together this list of some of the best collars for labradors and large dogs available on the market today. This is just a small selection of the collars reviewed in our roundup. For more, including high vis options, please continue to our article below. XS Puppy Paws Dog Collar: 1/2" wide, Adjusts 6-12"
Don't Forget Your ID Tags! A correctly fitted collar will be snug but not tight, allowing you to easily fit two fingers between the collar and the neck of your dog. Any tighter than this and the collar will be uncomfortable while likely rubbing off the fur around their neck. Any looser than this and your dog may be able to slip it off over their heads! Measure the circumference of your dog or puppy's neck and add to this 2 inches. Whatever number you arrive at is the thickness of neck you want to buy a collar to suit, while making sure you leave some room for manoeuvre either side. For example, if you measure your dog's neck to be 18 inches, add 2 inches making it a 20-inch collar you need. Then buy a collar that can fit a range of neck sizes with this figure exactly in the middle. So for the 20-inch collar we need, we'd look to buy one that fits from 18 to 22, or 16 to 24 inches. A collar and ID tag is compulsory by law in many places so you will want to make sure you always have at least two: One for every day use and another as an emergency replacement. An extremely popular, durable, bridle-leather collar, padded with soft lambskin inside for the ultimate in comfort for your dog. Made by Perri's - available in over 25 colors and numerous sizes, pick whatever color suits your mood but you will definitely want the large (16" to 20") or extra-large (20" to 25") sizes. This collar by 'Signature K9' is 1.5 Inch wide collar, made from extremely heavy-duty double layered leather, will last an absolute age and comes with very good feedback from previous buyers on Amazon. The design spreads weight and stress around the neck providing day long comfort for dogs working long hours. Made by the American Amish community, the craftsmanship is second to none and quality is assured. This collar is highly recommended. A very strong and durable collar made by 'Dogs My Love', with metal reinforced eyelets to ensure a long-lasting collar even in the face of repeated attachment and removal. All hardware is tarnish and rust resistant due to being nickel-plated, and the leather is trimmed with a thick and long-lasting waxed thread. The collar also has a plush suede lining for the ultimate in comfort for your pooch. This collar will look good any dog — at least we think so! Made from a non-porous material to repel water and dirt, this long-lasting and easy-clean neoprene dog collar has lots of very good feedback from previous buyers on Amazon. the design distributes load around a dog's neck for maximum comfort and prevention of pinching that is a problem with some collars. It is reflective for increased night-time safety and comes complete with an ID tag holder that is separate to the stainless steel D-ring for leash attachment. Available in 4 classic styles: Camouflage, black, red and pink, this collar is well-designed, strong and we think perfectly suited for the working dog or one who likes to get wet and dirty. The camouflage styling has a look to match! This 'No Stink' dog collar from the 'Dublin Dog Co.' is made with a special blend of synthetic polymers that reject moisture and dirt...and doesn't harbor smell creating bacteria! Hence the special 'no stink' moniker! Well suited to Labs that find every single muddy pool to play in! Easy to clean with nothing but warm water and very comfortable for your dog, sliding easily on their coats with no snagging or pulling on hair. Red and gray shown, other colors and styles are available so there's sure to be one to suit your tastes. These eco-friendly collars constructed from natural hemp fibers by 'Plant Dog' come complete with a comfortable fleece lining to provide maximum comfort for your dog. They are very quick and easy to snap on and off, available in a wide array of colors and have received lots of favorable feedback from previous buyers. The main benefit to this style of collar is the quick release buckle that makes it incredibly easy to take off in a hurry. Just squeeze and off it pops. Very useful for removing with ease if yours is a dog who likes to swim or get deeply into coarse undergrowth when you should always remove their collar. A very popular and highly rated collar from 'Lupine' and a very popular choice of collar for customers on Amazon. 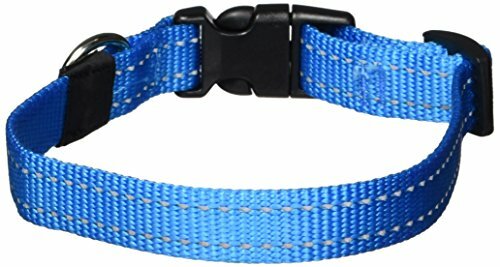 Made from Nylon with strong bar-tack stitching and a welded D-ring for leash attachment, this collar has all the features you need. Like the collar above, this comes with an easy operation side-release buckle for easy attachment and removal, just squeeze and it comes away. Pleasingly simple compared to the struggles of a traditional buckle if you;re wearing gloves or have numb hands in cold weather! Very strong and durable, Shown here in red but with 6 rich colors available. I've only shown here a small number of popular collars and they may not be to everybody's taste. But on Amazon there are hundreds of designs available and sure to be something to suit everybody's taste. Chewy is one of the best places to buy because there are so many options and so much competition that many products are offered with a sizable discount, keeping the prices very low. It's not always the case, but it's worth checking to find out! 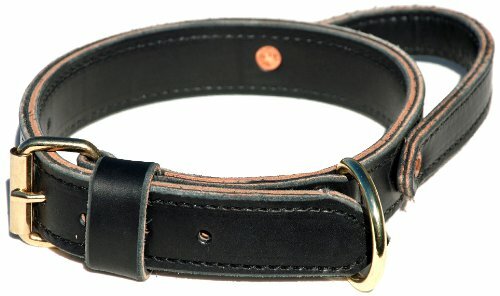 The best adult dog collars on Chewy, filtered to show only the highest rated and most popular. Puppies grow at a phenomenal rate so you will want to buy a collar that is highly adjustable to fit their expanding necks, otherwise you could be replacing the collar every few weeks. Also, because puppies tend to get into a lot more trouble than adult dogs, you will want a 'quick release' style collar so you can instantly free them if they get caught or snagged. To help you buy something suitable, we've provided below a small selection of collars perfectly suited for puppies, available from Amazon that have received fantastic reviews and feedback. This collar has a quick release fastening, perfectly suitable for a puppy (or small dog) as they get their little noses into everything and can often get their collars snagged and stuck. This is when you'll be pleased you went for a quick release fastening!. Black, blue, yellow and pink colors available, each with the distinctive 'paw print' design to keep puppy looking stylish, we're sure any puppy will look great wearing a collar from this range. A high quality, adjustable dog collar from the famous 'American Kennel Club'. 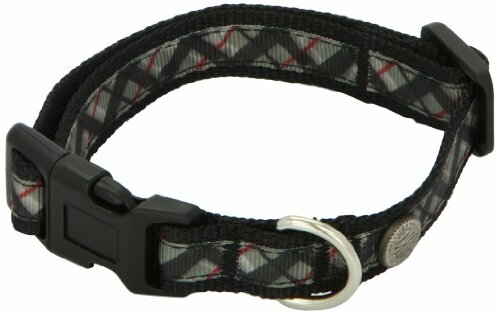 This collar has a quick release buckle, a D-Ring for leash attachment, is available in 3 sizes and comes in 2 colors, black or red. Soft and gentle for your puppy, strong and durable for you and your wallet (it will not need to be replaced before they outgrow it) this is a simple collar but with all the features you could hope for. Highly recommended. A high quality, soft yet durable, easily washable nylon webbing collar made by 'Sassy Dog Wear'. This collar has the highly recommended quick release buckle, perfectly suitable for a puppy so you can free them with speed and ease if they get it snagged on anything. And well know that will happen as they're curious little creatures aren't they?. Available in sizes to suit the smallest of puppies through to adult dogs, with 9 smart colors to choose from: Black, neon green, neon orange, neon pink, blue, brown, pink, purple and red. There is a color for all and it has very good customer feedback on Amazon. Over 150, 5-star reviews on Amazon.com! This straight forward yet stylish nylon webbing collar by 'Rogz' is highly durable and boasts high visibility for safety if out with your puppy in the dark. Available in 10 colors so there should be one to suit everybody's taste and it enjoys very good customer feedback from previous buyers on Amazon. If you haven't seen something to suit your taste, I've only shown a small selection of the most popular collars here and there are hundreds of other styles available. Chewy is one of the best places to buy because with so many sellers, competition is very high leading to many suppliers offering their products at the best prices to be found online. The best puppy collars on Chewy, filtered to show only the highest rated and most popular. 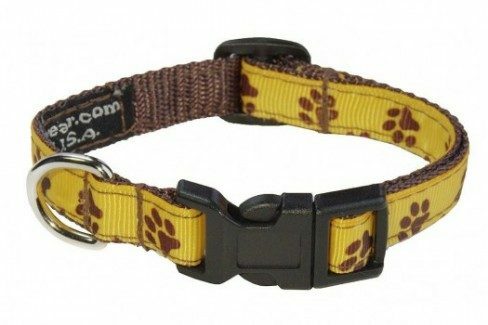 If you regularly walk your dog in low light or dark conditions, in the morning, at night or even during bad weather, then a high visibility dog collar is something you should seriously consider to improve your pets safety while out and about. High visibility dog collars allow other people, walkers, cyclists and motor vehicle users to see your dog and take appropriate caution, keeping not only your dog safer, but everybody else concerned too. Additionally, if you like to allow your dog off leash even though it's dark, but are always worried of their whereabouts because you cannot see them, a high visibility collar will give you the peace of mind you're looking for. You will always know EXACTLY where they are. This offering from 'Nite Ize' is a flexible red nylon collar with 'glow' or 'flash mode' LED lit polymer core for maximum visibility in dark conditions or night-time safety. Strong, durable and weather proof, with quick release easy to attach and remove fastening, it has all the features of a decent collar with the added bonus of making your dog as highly visible as possible for safety in the dark. A long life replaceable battery is included, so once received it is ready to go. 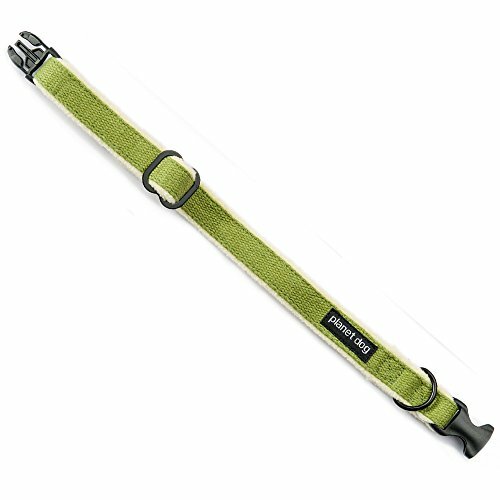 This offering from Illumiseen is a 100% Nylon Webbing collar with a metal alloy buckle. It's weatherproof, adjustable to fit all neck sizes and designed to be comfortable for your dog. One of the most effective high visibility dog collars available... with over 3,000 5-star reviews on Amazon! This collar is perhaps the most recommended among the many illuminated collars that seem to have sprung up on the market as of late. Rechargeable via USB, there's no batteries to replace so it offers better long-term value compared to most other brands that will have ongoing costs of battery replacement. Please remember: Not only do ID tags give you the best chance of being reunited with your with your puppy as quickly as possible if you lose them, they are also required by law in many places. So if you don't have any, it's a good idea to pick them up at the same time as choosing your collar.